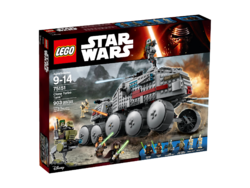 75151 Clone Turbo Tank is a Star Wars set released in 2016. 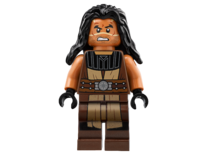 Includes 4 minifigures: Luminara Unduli, Quinlan Vos, Clone Commander Gree and an Elite Corps Clone Trooper, plus 2 Battle Droids. 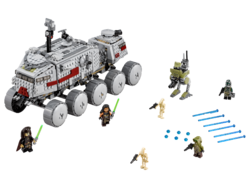 Features 10 rolling wheels with flexible suspension, rotating weapon turrets, spring-loaded shooters, extending observation post, dual cockpits and panels that fold down to reveal a detailed interior, including a mini AT-RT with a stud shooter and space for a minifigure. Ride rough terrain with the flexible suspension. Open the panels and lead the Clones and their Jedi allies in battle! Unload the AT-RT and join the fight against the Droid Army! Weapons include Luminara and Quinlan's Lightsabers and 4 blasters. Also includes electrobinoculars. This set offers an age-appropriate building experience for ages 9-14. Create your own Star Wars: Revenge of the Sith battle action scenes. Clone Turbo Tank measures over 6” (17cm) high, 12” (31cm) long and 5” (14cm) wide. AT-RT measures over 3” (8cm) high, 1” (5cm) long and 1” (4cm) wide. 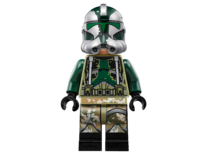 Facts about "75151 Clone Turbo Tank"
This page was last edited on 9 February 2019, at 22:03.